What Does “Do Not Duplicate” Mean? Most of us have had keys that say “do not duplicate.” Either you’ve ignored it, not needing a duplicate, wondered if you could get a duplicate if you needed, wondered what the consequences would be if you did duplicate it, or you also ignored it and made your duplicate key anyway. “Do not duplicate” is a suggestion; it is not a statement bound by law or enforced by punishment. However, there are many places, such as a hardware stores that will not duplicate your key. 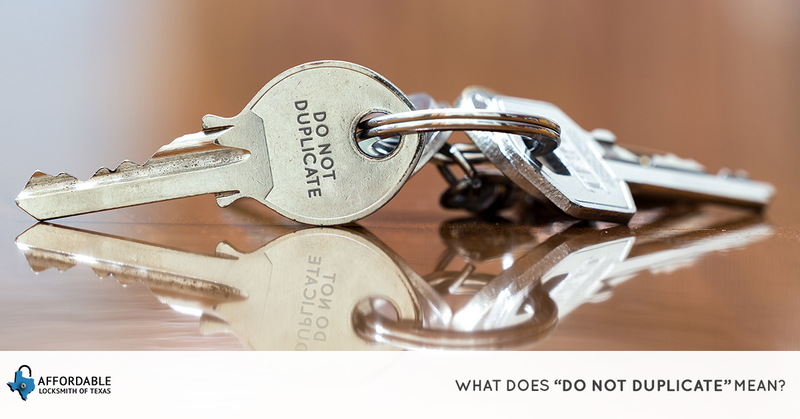 The “do not duplicate” statement is a passive means to control the amount of copies made of a key. This statement communicates to locksmiths that would make the copy of the key, the type of key that is being copied. Management of rentals and apartments will often have this phrase printed on their keys, as well as employers. Putting “do not duplicate” on keys is an attempt to promote security, but unfortunately as mentioned earlier, this method of security is only a passive means to keep your home, business, and property safe. Unauthorized key duplication is one of the leading causes of vandalism and security breaches. If you cannot control who makes a copy of your key, then you cannot control the security of your business and property. Though it is impossible to control every single situation, there are means to keep your home, business, property, and tenants safe and that is through proper key control. What is key control? Key Control is a means of making sure only authorized persons have a copy of your keys. It can be a system in which a record of those who have been given a key is kept and can employ a key classification system. Level 5 – Ordinary keys that have no restrictions on duplication. Level 4 – These keys are engraved with “do not duplicate,” but still may be duplicated. Level 3 – Restricted keys are those that can only be obtained from one source or supplier. Level 2 – Patented keys are under law meaning if one of these keys is copied, those in possession of the key can face legal action and financial penalties. Level 1 – Factory-only keys have the highest level of security and can can not be copied by anyone other than the factory and only by an authorized request. Other means of key control involve the use of an access peg that is inserted into a port near the keyhole. The peg cannot be removed until the key is returned to the lock. Also, electronic keys enable you to track who has requested entry. With an electronic key system, it is easy to perform an audit as to who has been gaining entry. The law does not protect you, if you loan a key to someone and they in turn violate your security, you are responsible. If you loan a key out always keep a record as to whom has had access to your key. As your local locksmith, we are here to help! We understand that whether you are a homeowner, business owner, or property manager that keeping what’s yours safe is of the utmost importance. The locksmiths of Affordable Locksmiths of Texas want to help those in Spring and The Woodlands feel safe and secure. First, always hire a licensed local locksmith to install your locks and copy keys. Licensed locksmiths are those that have been deemed upstanding citizens without a criminal record and have passed the necessary tests. Affordable Locksmiths of Texas have over 10 years of experience and over 10 years of happy clients. In all that we do, our locksmiths value your safety and security. To learn more about what it means to be a licensed locksmith, read our blog post! To learn more about us, your local locksmith for the Spring and The Woodlands, area read our About page. To be sure that your property is safe, hire a local locksmith to rekey your locks. By rekeying your locks, you are almost guaranteed to eliminate a breach in security before it becomes an issue. Rekey your locks, start keeping a record of who has access to your keys, and consider key systems that make it easier to keep track of where your keys go and with whom. Consult your local locksmith for the options you have to keep your property safe. As mentioned earlier, an electronic system can be an easy way to keep track of who is accessing your property, when, and how much. Remember that when you have an electronic system, you may have the capabilities to perform audits on key usage. Ask your local locksmith, if an electronic key system is right for your business. Affordable Locksmith of Texas is your local locksmith for Spring and The Woodlands and the surrounding areas. As mentioned before, our locksmiths are here to help you have optimal security: We can rekey, change your locks, install commercial electronic locks and more. If you do need copies of your keys, we can do that, too; we can make traditional keys, as well as transponder keys for your car, and more. If you find yourself locked out, contact us! We will contact you within 15 minutes with a solution. Have questions about key control? Contact us!